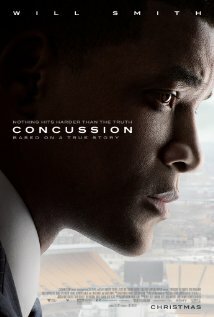 Movie Review: In the self-composed drama, “Concussion”, Will Smith is Dr. Bennett Omalu, a Nigerian forensic pathologist who discovers a disease called chronic traumatic encephalopathy (CTE), which is commonly associated with football players who were exposed to recurrent violent blows to the head, depending on their position in the field. While working at the Pittsburgh coroner's office, Dr. Bennett comes across the dead body of the former Pittsburgh Steelers center, Mike Webster, who died miserably in his pick-up truck after years complaining about painful headaches and forgetfulness. Intrigued by the scans of Webster’s brain, the very qualified and respectful doctor requires additional expensive exams, even if he has to pay out of his pocket, in order to figure out the real cause of the victim’s death. His conclusions become scientifically unshakeable when another three former players died of the same disorder. The discovery, initially discarded by the NFL, now forcefully draws the attention of the media and the new NFL commissioner. However, instead of thanking him properly for triggering awareness of the issue, the NFL tries to destroy Dr. Bennett’s reputation, inflicting on him an enormous pressure to make him break off the theory. Not for too long, though, since the truth comes always around, sooner or later. The directorial sophomore feature by Peter Landesman, who wrote based on the GQ article ‘Game Brain’ by Jeanne Marie Laskas, also stars Alec Baldwin as Julian Bailes, an allied doctor who’s very familiar with the sport in question and was Webster's close friend, and Albert Brooks, who gives a first-class performance as the county coroner and Bennett’s boss, Dr. Cyril Wecht. We’re before a super-interesting story given to us in a so-so execution whose narrative gaps and technical flaws aren’t as salient as the story itself.